Share the post "Paleo Diet Recipe: Shrimp on Rosemary Skewers"
Shrimp on Rosemary Skewers is a perfect combo if you need to impress your dinner guest. It is a perfect side dish to steak or a salad. Pairs nicely with red or white wine. Sprinkle shrimp with pepper &, paprika. Whisk olive oil, and chopped garlic, parsley, chives, thyme and lemon in medium bowl to blend. 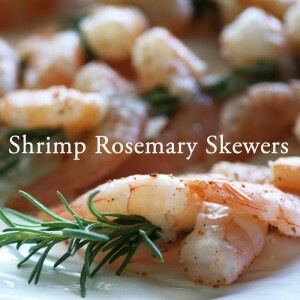 Coat shrimp with marinade brush with the whisked herbs and lemon and let stand at room temperature 15 minutes.